Detroit's Warrendale neighborhood has a lot of great things going for it, but do lack a comic book store. One of these days, I'll get around to changing that. In the meantime, nerds like me are about to rejoice the fact that this Saturday is Free Comic Book Day. Free Comic Book Day, as the name implies, is an annual event where comic book stores around the nation give out free comics to whet one's appetite for the glories of the comic book art form. Until Warrendale Comics opens, I give you a few nearby comic book stores that are participating in Free Comic Book Day. A-Z Comics (32659 Ford Rd. in Garden City). 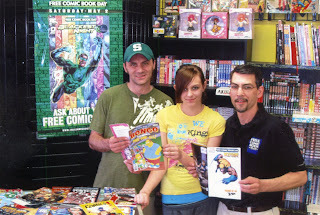 The guys at A-Z were kind enough to offer a sneak peek at Free Comic Book Day to Erik Monnier and his daughter, Syndney Yochum (13) of Livonia. A photo of this moment appears below courtesy of David L. Malhalab of M News Service / MNS Photo (313-5802393). Comics Archives (25650 Plymouth Rd. in Redford). I used to stop into this place all the time when I biked home from Bishop Borgess High School in the late 1980s; accumulating a rather impressive comic book collection - which promptly got thrown away by my Mom when I went away to college. Not that I'm bitter or anything. Free Comic Book Day. I invite everyone to stop by one of these shops and check out some cool comics. In the meantime, I wonder: do comic books make for a decent Mother's Day gift? I guess it would depend on the mom. I wouldn't mind a couple X-men or Wonder Woman comic books myself! LOL! I love you, Rebecca. FREE COMIC BOOK DAY - MAY 2ND SATURDAY - IS FOR MOMS AND DADS TOO. THANK YOU FRANK..FOR INCLUDING A MENTION. Definitely love Free Comic Book Day! Picked up quite a few goodies!